A preliminary seismic hazard assessment by Natural Resources Canada has identified possible earthquake scenarios for the Douglas Channel near Hartley Bay, Terrace and Bella Bella. The same studies indicate that while Kitimat may not be directly in a seismic zone prolonged earthquakes cause some damage in Kitimat depending on the earthquake and the condition of the soil in certain parts of the District. One model scenario says that in the event of a magnitude 8.0 earthquake off the west coast of Haida Gwaii, given certain soil conditions, there might actually be more damage in Kitimat than on the islands. That assessment, part of the overall the study by the Geological Survey of Canada indicates that the north coast of British Columbia from Prince Rupert to Bella Bella is likely face to “seismically induced ground failure”– mostly landslides. 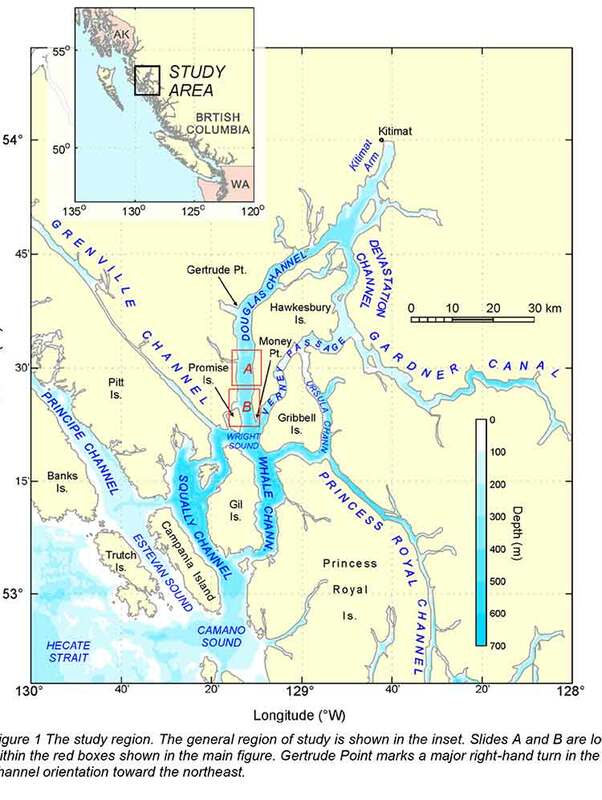 Now that studies have begun the Geological Survey has given the region its own new acronym BCNC (BC North Coast). Haida Gwaii is not part of BCNC, although earthquakes on those islands would likely impact the coast. 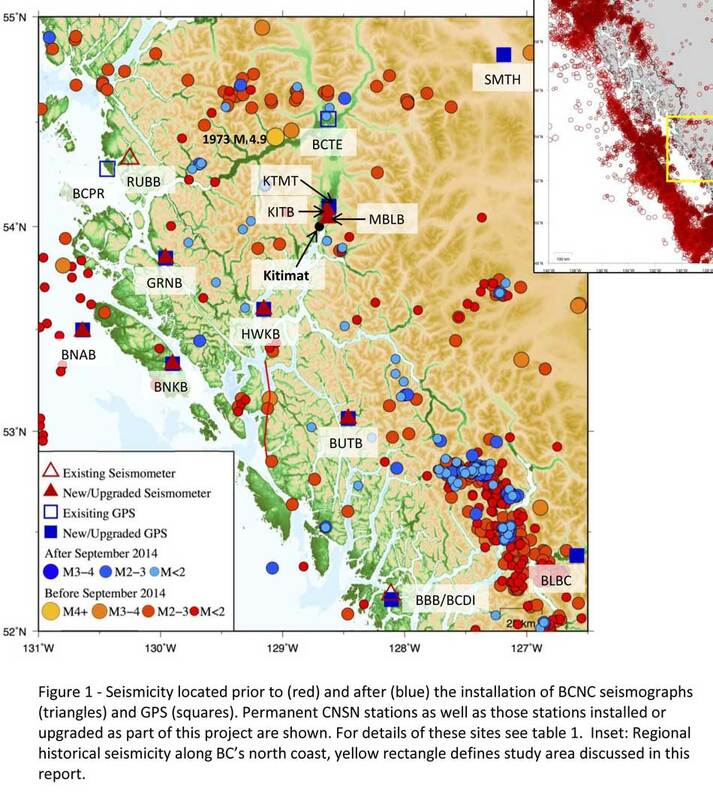 The Geological Survey says that historically “the BCNC has been seismically quiescent.” As a result “seismic monitoring and research related to the BCNC has been minimal.” That meant while larger earthquakes were “felt and recorded,” the configuration of the Canadian National Seismograph Network did not allow earthquakes less than approximately magnitude 2.1 to be monitored in northern BC. Now the Geological Survey is looking at “long-term, continuous monitoring of micro seismicity, combined with geodetic and paleo seismic techniques” that could be used to study at the possibility of large earthquakes, including a possible fault on the lower Douglas Channel. Since the studies began in August 2014, the Geological Survey identified 145 earthquakes within the study area, many too small to be felt since they are less than magnitude 2.0. Those earthquakes, however, were picked up by the new and improved instrumentation used by the earthquake monitors. The two reports one on “seismic hazards” and the second on “geohazards” says five “temporary seismonitors” (download reports from links below) were installed within the BCNC while some older stations were upgraded, saying, “It is expected that these new stations will be aid in locating small earthquakes” that were not previously detected by the existing network. The Geological Survey also installed ground movement monitoring GPS units along the coast. The use of the term “temporary” raises the question about how much ongoing monitoring is planned. 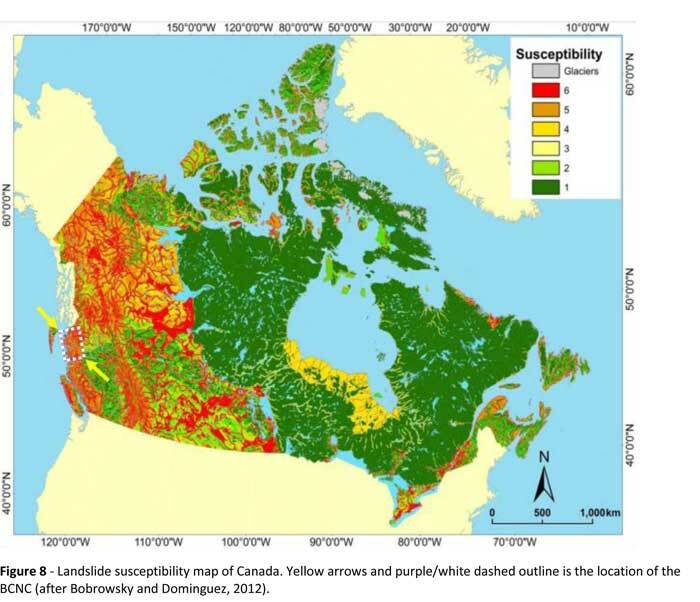 The study also notes that the current data is not included in the seismic standards in the current National Building Code of Canada, which in turn is based on the Natural Resources Canada Seismic Hazard Map. That may mean that municipalities in the BC North Coast region, in the future, as the seismic studies continue, may have to consider updating building codes, especially in areas of “softer soils” as opposed to harder rock. Over the years some small earthquakes have also been recorded on what the Geological Survey calls the “recently mapped fault-like structure” on Douglas Channel which was discovered in 2012. The survey is still calling it “fault-like” because it has not yet been confirmed as an active fault. A new map in the study shows that the “fault” runs from the southern tip of Gribbell Island, down the centre of Whale Channel east of Gil Island and then along the western coast of Princess Royal Island. There is also the previously identified ancient Grenville Channel Fault (ancient and believed inactive because it dates from the Cretaceous, the age of the dinosaurs) that runs from along Grenville Channel from Porcher Island in the north to Klemtu in the south which has experienced small earthquakes. The report also calls for more studies the local geology and soil conditions in the Kitimat Valley. A study back in 1984 by John Clague of Simon Fraser University showed that as the glaciers retreated during the last Ice Age there were “periods of stagnation” resulting in sediments that are thicker than other regions of British Columbia, Clague reported that in parts of Kitimat, the glacial moraine is hundreds of metres thick. After the glaciers were gone, the sea levels rose and glaciomarine sediments (clay, silt up to 60 metres thick) were deposited until the sea level fell to present-day levels. The report says that as these marine deposits were exposed to fresh water, salts were leached out resulting in saturated, porous sediments, including clay, which are prone to failure. Boreholes in the Kitimat area show that the clay and sediments above the bedrock can range from 17 metres to 106 metres. The report notes the presence of clay soils “can amplify ground shaking and secondary effects” as happened in November 1988 when there was an earthquake in the Saguenay region of Quebec. Originally reported as a 6.2 magnitude but later downgraded to 5.9, on Nov. 25, 1988, the major earthquake was centered near the Quebec cities of Chicoutimi and Jonquière, with aftershocks felt as far away as Toronto, Halifax and Boston. The quake lasted for two minutes, catching thousands of people off guard and leaving buildings damaged and power out for hundreds of thousands of Quebecers. CBC Television reported the earthquake caused a leak of toxic gas at the Alcan Aluminum plant at Jonquière, which was quickly contained. “There was no wind, we were basically lucky,” Alcan spokesman Jacques Dubac told CBC News at the time. The report says the most significant event within the BC North Coast study region (which as mentioned doesn’t include Haida Gwaii) was a magnitude 4.9 earthquake approximately 20 kilometers southwest of Terrace on November 5, 1973, which was felt as far as 120 kilometers away, with some minor damage (broken windows and cracked plaster) reported near the epicentre. The main shock at Terrace was preceded by a magnitude 2.5 foreshock four hours before, and followed by a felt magnitude 3.7 aftershock the next day. Another area most at risk, according to the report, is southern part of the BC North Coast zone, near Bella Bella, which is close to the northern section Cascadia Subduction Zone a “1,000 kilometre long dipping fault that stretches from Northern Vancouver Island to Cape Mendocino California” which one day will cause a major earthquake along the fault. The report says that a magnitude 9.0 or higher earthquake in the northern Cascadia Subduction zone close to Bella Bella would be similar to the March 2011 earthquake in Japan and the 1964 Good Friday earthquake in Alaska. For the northern part of the BC North Coast region, hazards could come from either a major earthquake off Haida Gwaii or a similar earthquake in south-eastern Alaska. The greatest hazard would come from “long period” earthquakes greater than magnitude 6.75 with an epicentre between 300 and 350 kilometers away where the shaking lasts longer than one second. 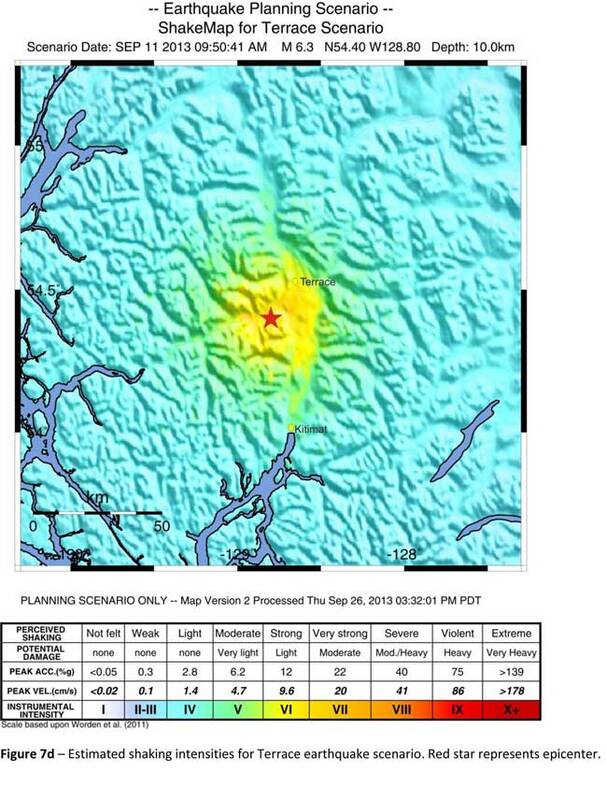 The Geological Survey modeled three possible scenarios for major earthquakes in the BC North Coast Region. For a short period earthquake, the report estimates that there would be minimal damage on Haida Gwaii similar to the damage from the 2012 earthquake with little or no damage on the BC North Coast. A long duration, long period earthquake that lasted longer than one second and up to three seconds or longer “may effect taller structures and trigger ground failure (that is liquefaction and lateral shaking).” Kitimat would feel that earthquake with the worst shaking in parts of the District with what the report calls “sensitive soils.” Coastal islands would feel double the amount of shaking as would occur in Kitimat. The second model looked at an earthquake in Douglas Channel based on the “fault like structure” if a slip strike rupture occurred along the entire 60 kilometers of the so far unconfirmed fault, resulting in a 7.2 magnitude earthquake. 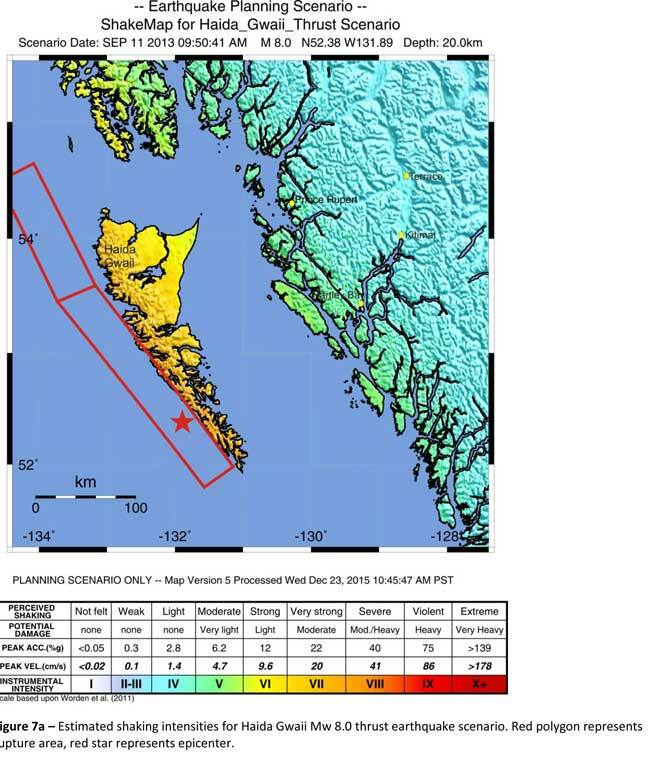 There would be very strong shaking within 20 kilometers radius of the epicentre, with moderate to heavy damage” in the relatively uninhabited islands, major shaking in Hartley Bay, resulting in very strong to strong damage at Hartley Bay and strong to moderate damage in Kitimat. On May 11, 1973, a magnitude 4.7 shallow earthquake took place about 20 kilometers south west of Terrace, on the south side of the Skeena roughly across from the Shames mountain area. The earthquake was felt up to 120 kilometers away. The report says “The event has not been associated with any geologic features in the area and little is known about its rupture process.” The model estimated the results of a larger earthquake 6.3 magnitude in the same area. 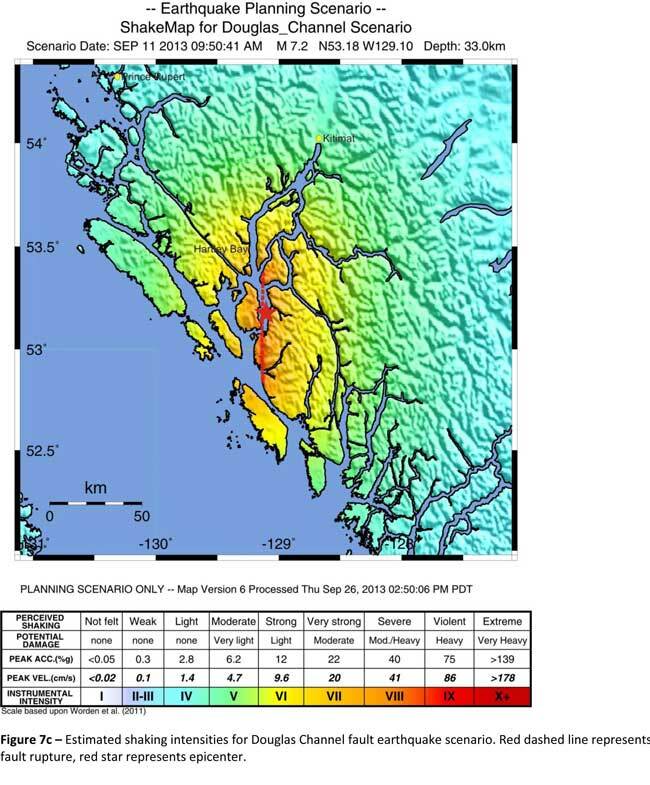 The model showed there would be strong to very strong shaking in Terrace, light to moderate shaking in Kitimat and light damage elsewhere in the BC North Coast. Most of the damage would be concentrated in a 20 kilometer zone around the epicentre. Another factor was the two well-known landslides occurred in the 1970’s in the Kitimat Arm which generated tsunamis but fortunately they occurred at low tide which decreased the impact. On October 17, 1974 a submarine slide generated a 2.8 metre tsunami. The following year on April 27, 1975, a slope failure on the northeast side of Kitimat Arm (which overlapped the 1974 failure area) displaced an estimated upper limit of 26,000,000 cubic metres of material. “Watermark observations in Kitamaat Village estimated that the tsunami generated by this slide was up to 8.2 metres high.” The report says that while the trigger of the first event is unknown; the latter event coincided with nearby construction at that time. Modelling of the 1975 slide estimates that given the right conditions the generated tsunami waves could have been as high as 11 metres. The report also notes that numerous landslides have also been mapped by the BC Department of Forestry in an attempt to improve safety measures for forestry workers. Another factor is the geology of the BC coast. The granitic mountains have rugged, steep slopes dissected by an intricate fjord system and dotted with islands of lower elevation. At lower elevations the land is covered by wet, coastal hemlock forests, which could be vulnerable to ground failures whereas higher elevations are characterized by barren rock or mountain hemlock subalpine. The District of Kitimat said it has “not directly studied these issues but we are aware of potential hazards.” The development department has been advised of potential issues and site concerns. The District of Kitimat did cooperate with National Resources in finding a location for their recently installed seismic equipment. At Harley Bay, Gitga’at First Nation CEO Ellen Torng said the Gitga’at have been “ working with NRCan on their research in the Douglas Channel and in Hawksbury. NRC has been meeting with First Nations along the coast and have conducted community sessions on their research. “We hosted one community session here in Hartley Bay and have regular updates from their technical team when they are in the area,” Torng said. In addition, the District of Kitimat told Northwest Coast Energy News that Community Planning & Development department also provided local land information to geoscientists in the years leading up an international study called Batholiths on land in 2009. Batholiths are large zones of molten rock that have solidified in the earth’s crust and are believed to play a key role in the formation and growth of continents. The Coast Mountain Range has a large concentration of batholiths, which means Kitimat was an excellent place to study the earth’s crust. The project, which involved more than 50 scientists from nine Canadian and American universities, was set up to examine how mountain belts form and change over time and why continental mountain ranges are made of granite not basalt. Seismic imaging of the crust and mantle below the mountains required deploying thousands of seismic sensors and recorders, and recorded responses to several man-made detonations. Field work was completed in July 2009, and several scientific papers and dissertations have followed. The Heiltsuk Nation was unable to respond to a request for comment due to the ongoing crisis from the sinking of the tug Nathan E. Stewart and the resulting spill of diesel fuel and other contaminants near Bella Bella. I Not felt Not felt except by a very few under especially favorable conditions. II Weak Felt only by a few persons at rest,especially on upper floors of buildings. III Weak Felt quite noticeably by persons indoors, especially on upper floors of buildings. Many people do not recognize it as an earthquake. Standing motor cars may rock slightly. Vibrations similar to the passing of a truck. Duration estimated. IV Light Felt indoors by many, outdoors by few during the day. At night, some awakened. Dishes, windows, doors disturbed; walls make cracking sound. Sensation like heavy truck striking building. Standing motor cars rocked noticeably. V Moderate Felt by nearly everyone; many awakened. Some dishes, windows broken. Unstable objects overturned. Pendulum clocks may stop. VI Strong Felt by all, many frightened. Some heavy furniture moved; a few instances of fallen plaster. Damage slight. VII Very strong Damage negligible in buildings of good design and construction; slight to moderate in well-built ordinary structures; considerable damage in poorly built or badly designed structures; some chimneys broken. VIII Severe Damage slight in specially designed structures; considerable damage in ordinary substantial buildings with partial collapse. Damage great in poorly built structures. Fall of chimneys, factory stacks, columns, monuments, walls. Heavy furniture overturned. IX Violent Damage considerable in specially designed structures; well-designed frame structures thrown out of plumb. Damage great in substantial buildings, with partial collapse. Buildings shifted off foundations. X Extreme Some well-built wooden structures destroyed; most masonry and frame structures destroyed with foundations. Rails bent. A “devastating megathrust earthquake” could hit Haida Gwaii sometime in the future, according to Canadian and US studies carried out after the magnitude 7.8 earthquake off Haida Gwaii on Oct. 27, 2012 and the 7.5 magnitude quake off Craig, Alaska, a few weeks later on Jan. 5, 2013. The 2004 Indian Ocean earthquake and the 2011 Tōhoku earthquake in Japan, both accompanied by major tsunamis are recent examples of “great” (higher than magnitude 8.0) megathrust earthquakes. Most of the concern on the west coast has been the likelihood of a megathrust earthquake on the Cascadia Fault on the Juan de Fuca plate that stretches from northern California to the middle of Vancouver Island. The 2012 Haida Gwaii main shock was the second largest seismic event in Canada since the establishment of a modern seismograph network. The first was the 1949 Haida Gwaii/Queen Charlotte earthquake with a magnitude of 8.1 That 1949 Haida Gwaii earthquake was a strike-slip event, where the plates move side-to-side, similar to the 1906 San Francisco earthquake and other quakes on the San Andreas Fault in California. The 2012 Haida Gwaii earthquake is characterized in the studies as a “mini-megathrust” event, where part of the crust is pushed upward, meaning that a larger megathrust could have much more destructive consequences from both the earthquake and a possible tsunami. The new studies show that the Pacific and North America plate boundary off the coast of British Columbia and southeastern Alaska creates a system of faults capable of producing very large earthquakes. 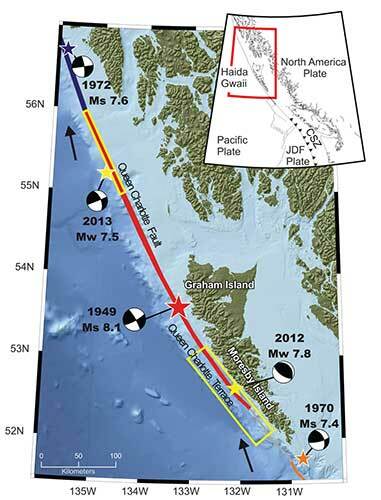 The scientists conclude that while the two earthquakes in 2012 and 2013 released strain built up over years on the tectonic plates, those events did not release strain along the Queen Charlotte Fault off the west coast of Haida Gwaii. That means the fault remains the likely source of a future large earthquake. A special issue of the Bulletin of the Seismological Society of America (BSSA), released Monday, April 6, 2015, contains 19 scientific and technical papers, outlining the results of the work carried out over the past two years. The team estimated the rupture dimension of the 2012 Haida Gwaii earthquake to be about 120 kilometres long at a depth of about 30 kilometres. The Craig earthquake ruptured the Queen Charlotte fault over a distance of more than 100 kilometres and at a depth of about 20 kilometres. The two areas are joined in what is called the Queen Charlotte Fairweather Fault System. To the south the Queen Charlotte Fault also interacts with the Juan de Fuca plate that stretches from Vancouver Island to northern California. “The study of these two quakes revealed rich details about the interaction between the Pacific and North America Plates, advancing our understanding of the seismic hazard for the region,” said Thomas James, research scientist at Geological Survey of Canada. The studies conclude that the interaction between the plates off Haida Gwaii is much more complex than previously believed. Before the 2012 earthquake, the Queen Charlotte Fault, a strike-slip fault similar to the San Andreas Fault in California, was believed to be the dominating tectonic structure in the area. The 2012 tremor confirmed the existence of a previously suspected thrust fault beneath what is called the “Queen Charlotte Terrace,” to the west of the Queen Charlotte Fault, where the Pacific plate is sliding at a low angle below the North American plate. The earthquake was “essentially a mini-megathrust earthquake along the dipping plate interface of a subduction system,” one of the scientific papers says. 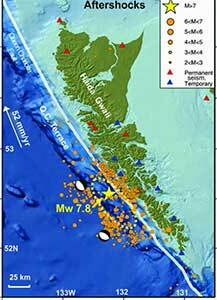 The epicenter of the Haida Gwaii main shock was located about five kilometres landward (northeast) of the Queen Charlotte Fault. That probably means that the rupture was near the bottom of the locked plates, where the plate motion’s side to side movement is also thrusting downward. Significant aftershocks appeared to cluster on the periphery of the main rupture zone with most of the aftershocks occurring seaward to the west. 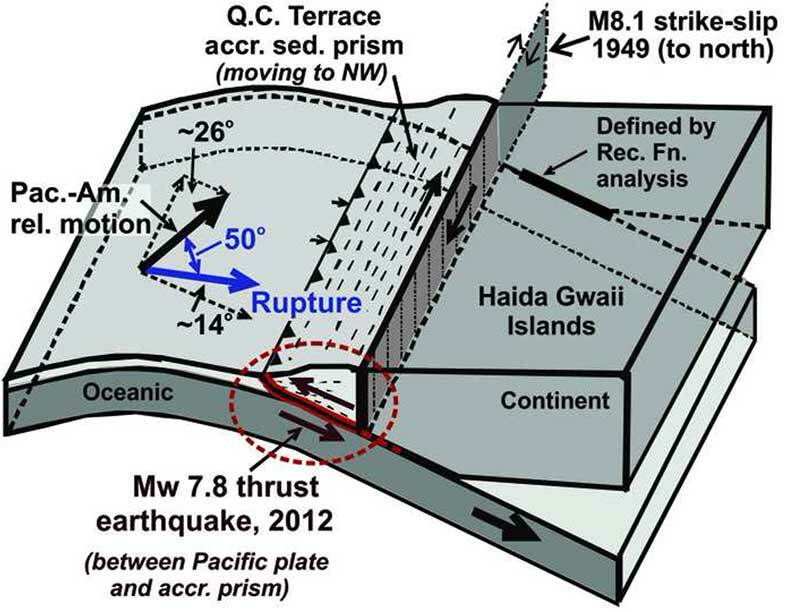 The scientists used GPS observations of crustal motion to locate the earthquake’s rupture offshore to the west of Haida Gwaii. The situation off Haida Gwaii is complex because while the Pacific plate is converging with the North American plate at a rate of 15 to 20 millimetres a year, at the same time the two plates are slipping by each other toward the north northwest at angle of about 20 degrees at a rate of about 50 millimetres a year. Honn Kao, a seismologist with the Geological Survey of Canada said, “This was an event the thrust interface of the plate boundary system, confirming that there is a subduction system in the Haida Gwaii area. “The implication of a confirmed subduction zone is that in addition to the Queen Charlotte Fault, we now have another source which can produce devastating megathrust earthquakes in the area,” said Kao. The study of the Haida Gwaii tremor looked at the causative faults, the rupture processes and depths of the main shock and sequence of strong aftershocks. The Haida Gwaii earthquake generated a significant tsunami that left deposits indicating run-up exceeding 3 metres (maximum 13 metres) in a number of bays and inlets along about 230 kilometres along the west coast of Haida Gwaii. In Hawaii, a 0.8 metre wave was measured on a tide gauge. In Queen Charlotte City perceptible shaking lasted for one and half to two minutes, with very strong shaking for about 30 seconds. The earthquake was felt as far away as Yukon Territory, Alberta, and Montana. The Haida Gwaii rupture also shook southeastern Alaska. The northwest direction of ground motion then may have influenced the timing of the Craig earthquake a few weeks later in January 2013. That earthquake occurred farther north in southeast Alaska, where relative plate motion is nearly parallel to the Queen Charlotte fault. The Haida Gwaii aftershocks clustered around the periphery of the rupture zone, both on the seaward and landward side of the plate boundary and reflected what the study calls “normal faulting behavior–caused by the bending, extending or stretching of rock– rather than the thrust faulting of the main shock.” The pattern of aftershocks is similar to those observed after the 2011 Japanese megathrust earthquake. 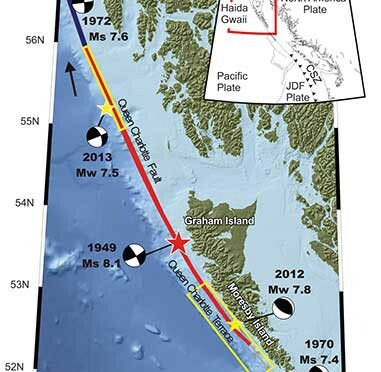 “Our observations of normal faulting imply that the main shock of the Haida Gwaii earthquake dramatically altered the stress field in the rupture zone, especially in a neighboring region,” Kao said. The distribution of aftershocks occurred to the north of a previously identified seismic gap where large earthquakes have not occurred in historic times. The gap is located to the south of the where 1949 magnitude 8.1 Queen Charlotte earthquake ruptured. Though the Haida Gwaii earthquake may have activated some part of the Queen Charlotte Fault, Kao said, it was limited and did not relieve stress along the seismic gap. The Haida Gwaii event confirmed substantial seismic and tsunami hazard from large thrust events on the plate margin along the southern Queen Charlotte fault. It occurred where relatively young oceanic lithosphere under thrusts North America and in some ways is an analog for the much larger megathrust earthquakes known to occur on the Cascadia subduction zone to the south, where the young Juan de Fuca plate and other small plates subduct beneath North America. The Haida Gwaii earthquake had a complex pattern of main shock rupture and aftershocks and a large tsunami. The Geological Survey of Canada plans further studies to understand the formations off Haida Gwaii. Megathrust earthquakes occur at subduction zones at destructive plate boundaries where one tectonic plate is subducted (forced underneath) by another. These interplate earthquakes are the planet’s most powerful, with moment magnitudes that can exceed 9.0. Since 1900, all earthquakes of magnitude 9.0 or greater have been megathrust earthquakes. During the rupture, one side of the fault is pushed upwards relative to the other, and it is this type of movement that is known as thrust. The displacement of the ocean in a thrust can trigger a tsunami. A transform fault is one where the motion is predominantly horizontal. Those faults end abruptly and are connected on both ends to other faults, ridges, or subduction zones. The best-known (and most destructive) are those on land at the margins of tectonic plates. Transform faults are the only type of strike-slip faults at plate boundaries show strike-slip or side-to-side in movement. The Queen Charlotte Terrace is a 25 kilometre wide zone of built up marine sediment immediately west of the active Queen Charlotte fault. The crust is about 12 kilometres thick at the terrace. On Haida Gwaii, the earth’s crust is 18 kilometres thick at the eastern edge. On the BC mainland the crust is in excess of 30 kilometres thick. The 1949 Haida Gwaii quake was one of the largest in the recorded history of North America. The largest known earthquake along the coast was the megathrust event on the Cascadia fault on January 26, 1700 where the Juan de Fuca plate ruptured for about 1,000 kilometres along from what is now northern California to Vancouver Island, estimated at magnitude 9.0. The dating is based on a tsunami that hit Japan that had no associated local earthquake as well studies of tree rings from the remains of trees downed in the tsunami. Three studies of the geology of Douglas Channel are near completion and publication, according to Natural Resources Canada. That news comes as studies, released today, warn of a major megathrust earthquake on the fault west of Haida Gwaii. 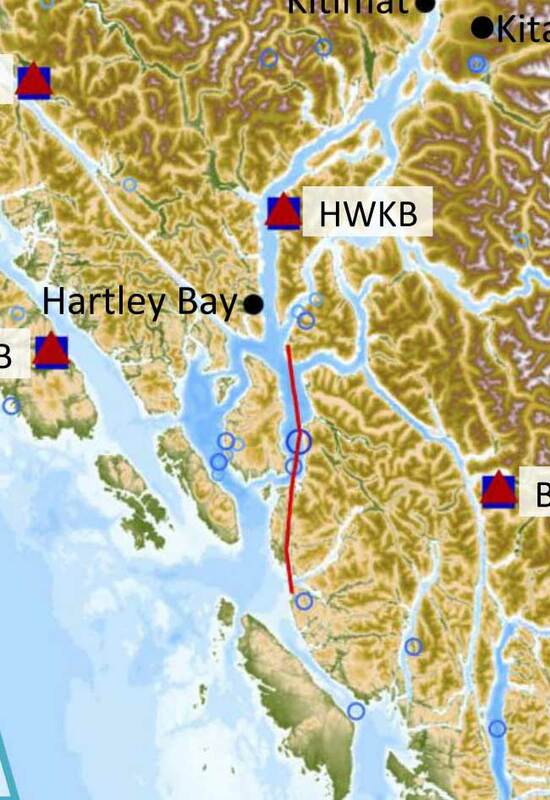 Northwest Coast Energy News asked the Geological Survey of Canada if there were any recent updates available after the agency said that a survey had located a “possible fault” on Hawkesbury Island during studies for the Enbridge Northern Gateway Joint Review Panel. The initial joint survey by the Geological Survey of Canada and Fisheries and Oceans in September 2012, found a tsunami hazard and a possible seismic fault in Douglas Channel near Kitimat. The follow up study by Fisheries and Oceans, released about three weeks after the Haida Gwaii earthquake, in November 2012, identified two slope failure events on the southern end of Hawkesbury Island during the mid-Holecene period, between 5,000 and 10,000 years ago. That study showed that the tsunami from the slope failure reaching Kitimat would have been about 60 centimetres or 23 inches. Hartley Bay would have been hit by a wave height of 7.5 metres or about 25 feet. More recently there were slope failures nearer to Kitimat. The first slope failure occurred on October 17, 1974, triggering a 2.4 metre tsunami at low tide. Then on April 27, 1975 there was a second slope failure near low tide on the northeast slope of the Kitimat Arm that generated an 8.2 metre tsunami. The 1975 tsunami destroyed the Northland Navigation dock near Kitimat and damaged the Haisla First Nation docks at Kitamaat Village. As well as the fact that recent studies say the mainland margin coastal zone has had very little historical seismicity, it adds no currently active faults have been identified. A study ten years ago identified some very ancient faults which have not been active since the Eocene, about 33 to 56 million years ago. GPS studies show that in northwestern British Columbia coastal block is moving northeast at the rate of just 5 millimetres a year. 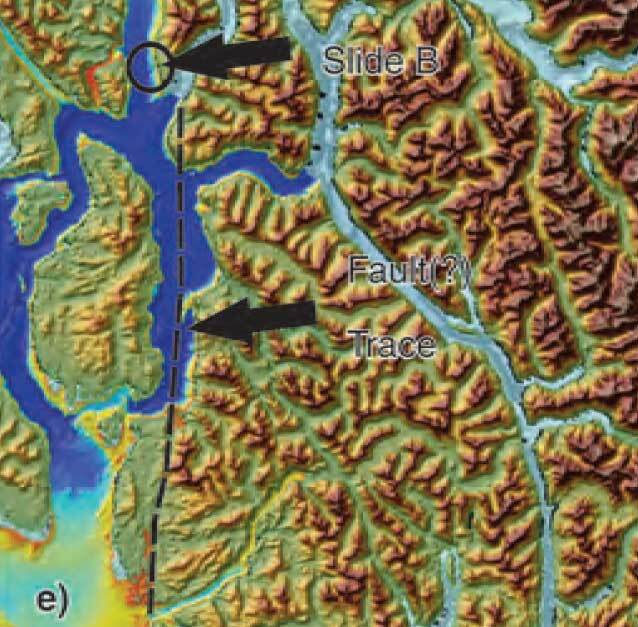 A follow up study by the Department of Fisheries and Oceans on the discovery of prehistoric slope failure tsunamis in Douglas Channel concludes that the events would have had minimal impact on Kitimat but would have destroyed Hartley Bay. The studies were filed by DFO with the Northern Gateway Joint Review Panel on Friday, November 16, following an earlier study the Geological Survey of Canada that reported the discovery of the submarine slope failures. The filing comes just three weeks after the region was shaken by a 7.7 magnitude earthquake off Haida Gwaii and a subsequent coast-wide tsunami warning. 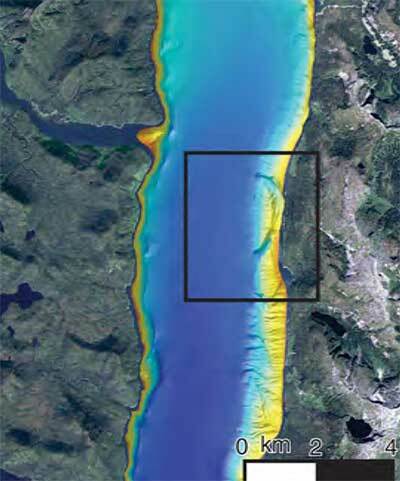 The DFO follow up study was aimed at better understanding the dynamics of tsunamis during the two slope failure events on the southern end of Hawkesbury Island during the mid-Holecene period, between 5,000 and10,000 years ago. The wave dynamic model study does not address the discovery by the Geological Survey of Canada of a possible fault line along Hawkesbury Island which could have been the cause of the slope failures. The study estimates that the wave amplitude of the first tsunami reaching the proposed Enbridge Northern Gateway terminal site near Kitimat would have been about .09 to .12 metres. Since the actual wave height hitting land from a tsunami is one half of the amplitude, the height of tsunami waves reaching Kitimat at the time would have been about 60 centimetres or 23 inches. At Hartley Bay, on the other hand, the maximum estimated wave amplitude from the second tsunami would have been 15 metres, meaning a wave height of 7.5 metres or about 25 feet. The main reason for the difference is that both the submarine slope failures occurred south of the dogleg in Douglas Channel at Gertrude Point. That meant the configuration of the channel from Gertrude Point up to Kitimat would lessen the amplitude whereas because Hartley Bay was so close, it would be hit by a higher amplitude. The report says that because of their relatively short wavelengths, the tsunami waves undergo multiple reflections that the “high degree of scattering from the complex shoreline and bottom topography in Douglas Channel” would “combined with the flux of tsunami energy through adjoining waterways and channels” have caused a rapid decrease in the energy of the waves with distance south and north of the slide area. 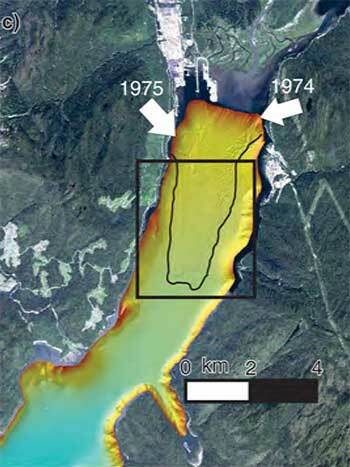 The study also points out a crucial difference between the ancient slides and the two that occurred near Kitimat in 1974 and 1975, while the land near the head of the Kitimat arm were largely composed of material laid down by the glaciers, the large slope failures on Hawkesbury Island were blocks of an extremely hard igneous rock called diorite. Each of the prehistoric slides would have consisted of about 65 million cubic metres of rock. Coastal British Columbia is an area of steep slopes, extreme seasonal variations in soil moisture, large tidal ranges, and the highest seismicity in Canada. Hazards of this form have been well documented for the coastal region of British Columbia, and other fjord regions of the world’s oceans, including Alaska and Norway. These factors increase the potential for both submarine and subaerial slope failures in the region. Such events generally take place in relatively shallow and confined inner coastal waterways, and can present hazards in terms of tsunami wave generation. The failures are defined by scallop-shaped hollows located along the edge of the fiord wall and appear to be associated with detached blocks that extend out several hundred metres into the channel. The two block slides identified in Douglas Channel are characteristic of rigid-body submarine landslides, which differ considerably from the well-documented viscous submarine landslides with a lower specific gravity (density relative to water) of about 1.5 that occurred to the north of Douglas Channel along the inner slope of Kitimat Arm in 1974 and 1975. The report’s modelling is “considered minimum values” because the do not include debris that would have spread into the fiord after initial slide. That debris is now buried by a thick layer of post-slide sediment. The reconstruction model shows that the head of the more northern slide began at a depth of around 60 to 100 metre, while that of the more southern slide began at a depth of 75 to 120 metres. The slides would have moved down slope at about 25 metres per second, coming to rest after about 30 seconds, 250 to 350 metres from the slope at a depth of 400 metres. The leading tsunami waves generated by Slide A reach Kitimat Arm in roughly 20 min and have small amplitudes of only a few centimetres. Although later waves have higher amplitudes, the maximum wave amplitudes (which occur 50-55 minnutes after the failure event) are still only around 0.09 to 0.12 metres. The southern slide on Hawkesbury, called Slide B by the scientists, would have moved 400 metres before stopping. It stared at a greater depth than Slide A, with not as much vertical displacement than Slide A. That means Slide B was slower than Slide A.
would have generated large waves in the vicinity of the failure region. Simulated waves reach the coast adjacent to the slide region within a minute of the failure event, with wave amplitudes of up to 10 metres. The waves also hit the opposite site of the channel within a minute of the failure event and then take an additional minute to reach Hartley Bay where waves reach amplitudes of 15 metres/ Powerful oscillations in the bay last for tens of minutes. Waves with high amplitudes (more than 2 metres) also occur in the southern part of Douglas Channel, and in certain locations of Verney Passage. According to the models, the leading tsunami waves would have reached the Kitimat Arm 22 minutes after the start of the slide. The maximum waves would have had amplitudes of 0.08 metres to 0.3 metres (6 inches), reach the Kitimat Arm 45 to 60 minutes after the start of the failure event. The the tsunami waves generated by Slide B that impact Kitimat Arm, although still of low amplitude, were somewhat higher than those generated by Slide A, despite the fact that Slide B was located further to the south and generated less energetic waves in the source region than Slide A. This seeming paradox is explained by the slower motion of Slide B, which causes it to generate more wave energy in the low frequency band…Due to their reduced scattering and reflection, the relatively long and lower frequency waves generated by Slide B propagate more readily through the complex fjord system than the relatively short and higher frequency waves generated by Slide A. If similar submarine slides were to occur again somewhere in the same general area, they could present a significant risk to navigation and to nearby shore installations and coastal communities…. As with the tsunami generation regions, the highest waves and strongest currents in any particular region of the coastal waterway would occur near the shoreline. Based on the numerical findings, tsunamis generated by submarine landslides of the form identified for the southern end of Douglas Channel would have heights and currents that could have major impacts on the coastline and vessel traffic at the time of the event throughout much of Douglas Channel, but a minor impact on water levels, currents and hence vessel traffic in Kitimat Arm. Hartley Bay, at the southern end of Douglas Channel, would be impacted by high waves and strong currents, whereas Kitimat, at the northern end of Kitimat Arm, would experience negligible wave effects. Additional modelling would be required to assess the characteristics of possible tsunamis originating beyond the area of the two identified slope failures. At the estimated propagation speeds of about 65 metres per second, the detailed model says it takes roughly 10 to 15 minutes for the simulated waves to propagate approximately 40 to 45 kilometres to the intersection of Douglas Channel and Kitimat Arm, where peak wave amplitudes would be diminished to less than one metre. It takes another 15 minutes for the waves to reach sites near the proposed Enbridge facilities in Kitimat Arm where wave amplitudes would be reduced to a few tens of centimetres and associated currents to speeds less than a few tens of centimetres per second. 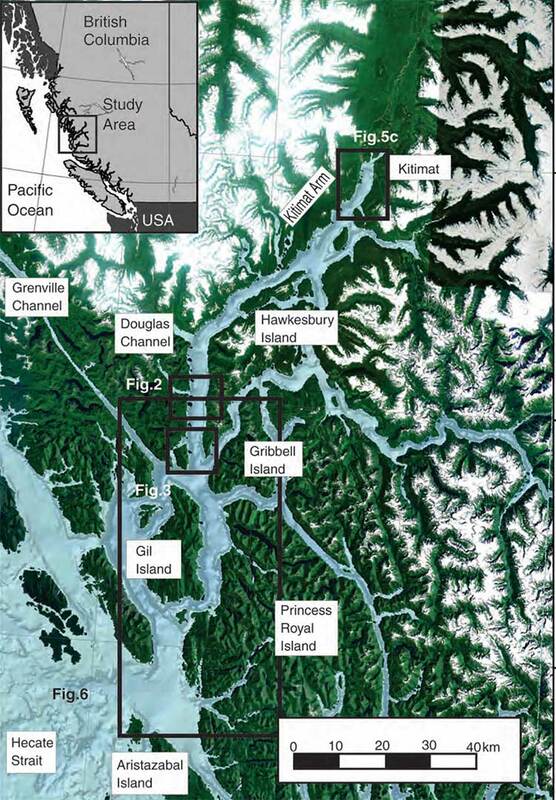 The Northern Gateway Joint Review panel has allowed the Department of Fisheries and Oceans and Natural Resources Canada to delay a report on historic tsunamis and a possible fault line on Douglas Channel until November 16, 2012. The report was scheduled for release on October 31. The Panel believes the Modelling to be relevant, as noted in Ruling no. 105. The Panel is also ofthe view that there is unlikely to be any undue prejudice to any party by permitting its filing to be delayed to 16 November 2012. A preliminary report was released in early September and outlined evidence of major slope failures on the islands in Douglas Channel and also a possible fault line along part of the Douglas Channel. The Department of Justice filed the request with the JRP on Monday Oct. 30, 2012, less than 48 hours after a major earthquake of magnitude 7.7 struck off Haida Gwaii just after 8 p.m. Pacific Daylight Time, on Saturday Oct. 27, shaking much of northern BC. There have been numerous aftershocks since the main quake. The Geological Survey of Canada has identified a tsunami hazard and a possible seismic fault in Douglas Channel near Kitimat. A scientific paper by the Geological Survey and the Department of Fisheries and Oceans says there were once two giant landslides on Douglas Channel that triggered major tsunamis and that the landslides were possibly caused by an earthquake on the fault line. Kitimat is the proposed site of the Enbridge Northern Gateway project and at least three liquified natural gas projects. If the projects go ahead, hundreds of supertankers with either bitumen or LNG will be sailing in the channel for years to come. A filing by the Attorney General of Canada with the Northern Gateway Joint Review Panel is asking the JRP for leave to file late written evidence long after the original deadline of December 2011. The Attorney General’s motion was filed on August 17, but went unnoticed until the Kitimat environmental group Douglas Channel Watch brought the matter up with District of Kitimat Council tonight (Sept. 17). Appended to the Attorney General’s motion is a copy of a scientific paper from the Geological Survey “Submarine slope failures and tsunami hazards in coast British Columbia: Douglas Channel and Kitimat Arm” by Kim W Conway, J.V. Barrie of the Geological Survey and Richard E. Thomson of the Department of Fisheries and Oceans. It goes on to say: “The failures comprise blocks of bedrock and related materials that appear to have been detached directly from the near shore off Hawkesbury Island.” Hawkesbury Island and many of the other islands in Douglas Channel are built up with material left over from the ice age glaciers and thus are vulnerable to displacement and landslides. The slope failure landslides are covered with thick layers of mud, and that, the scientists say, could mean that the failures could be ancient, possibly occurring 5.000 to 10,000 years ago. Further research is needed to confirm the date of the giant slides. What is worrying about the discovery is that fact that there were two recent submarine slope failures on the Kitimat Arm of Douglas Channel. both creating tsunamis. The first slope failure occurred on October 17, 1974, triggering a 2.4 metre tsunami at low tide. Then on April 27, 1975 there was a second slope failure near low tide on the northeast slope of the Kitimat Arm that generated an 8.2 metre tsunami. The 1975 tsunami destroyed the Northland Navigation dock near Kitimat and damaged the Haisla First Nation docks at Kitamaat Village. Urgent new research is underway and the filing by the Attorney General says when the Department of Justice requested leave to file late evidence says it anticipates that the further research by DFO is expected to be completed by November 1. The Natural Resources Canada Earth Sciences Sector began a national assessment of submarine slope failures in Canada in late 2011 and completion of the Pacific portion of this assessment is targeted for December of 2012. The Attorney General’s filing says that DFO is now modelling “potential wave heights and speeds that may have resulted from the two previously unrecognized submarine slope failures in the Douglas Channel.” The model will use high resolution scans of the Douglas Channel seafloor to create the models. 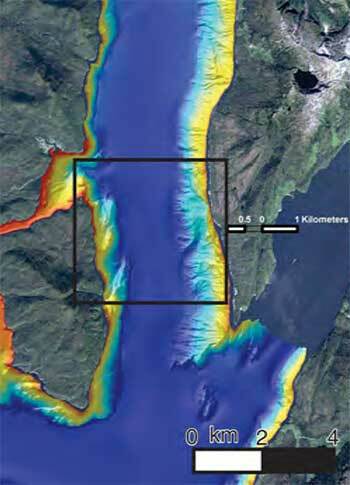 The survey of Douglas Channel in 2010 suggests the possible existence of a fault immediately to the south of the second ancient slide on Hawkesbury Island. The GSC paper says that evidence for a continuous fault was observed by aligned stream beds and fractures on the south end of Hawkesbury Island, about four kilometers from the site of the second ancient slide. The possible fault then appears to terminate far to the south near Aristazabal Island on the Inside Passage. The Geological Survey says that eleven small earthquakes, all less than magnitude three, have appeared with 20 kilometres of the suspected fault over the past 25 years. The paper says that the scientists conclude that the slides appear to have left very steep slopes at or near the shoreline that could be susceptible to future failure events. A large potential slope failure has been identified near one of the ancient slides…. in the absence of additional evidence, the fault must be considered a potential trigger for the submarine failure events….the triggers for the failures have not been defined; however, their proximity to a potentially active fault represents one potential source. The failures probably generated tsunamis during emplacement and conditions exist for similar failures and associated tsunamis to occur along this segment of Douglas Channel in the future. provide an improved understanding of the generation, propagation, attenuation, and likely coastal inundation of tsunami waves that would have been created by slides… or that could be generated from similar future events. 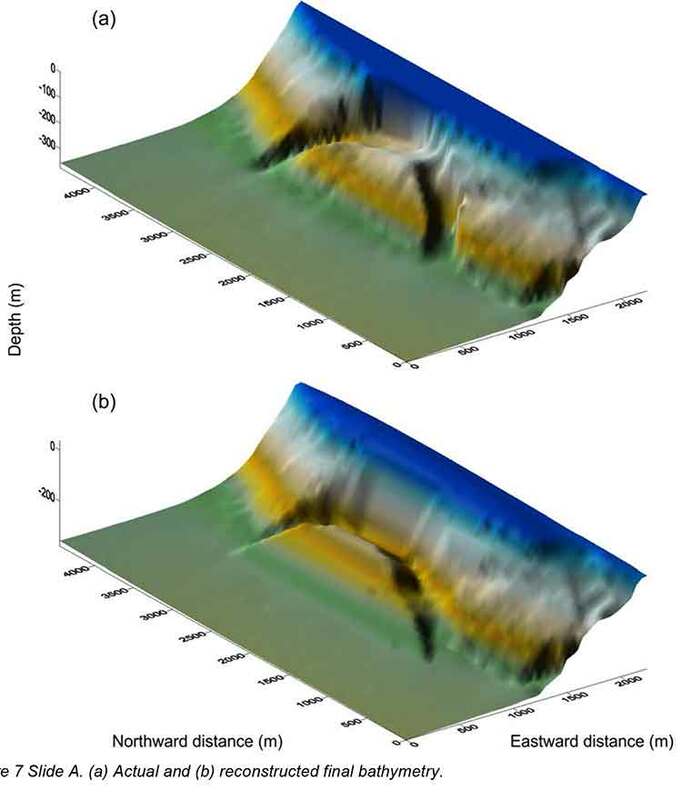 Only through the development and application of this type of tsunami modelling will it be possible to gauge the level of hazard posed by the identified submarine slope failures to shore installations and infrastructure, or to devise ways to effectively mitigate the impacts of future such events. The filing by the Attorney General offers to bring the scientists to the Joint Review Panel to appear as witnesses sometime during the final hearings. The filing notes that the current evidence tendered to the JRP by Enbridge, and other parties does demonstrate the potential for marine geohazards and associated tsunami events. Enbridge’s design of the proposed Northern Gateway marine terminal and its operational plans took into consideration the current state of knowledge of geohazards including earthquakes and tsunamis at the time of filing. Enbridge has said it would undertake further geological survey during the detailed design phase for the terminal. the geographic scope for potential landslide induced tsunami hazards is now better understood to extend beyond the Kitimat Arm. NRCan and DFO seek by this motion to ensure that this Panel, and the Parties before the Panel, have the most up to date information on geohazards in the Douglas Channel. Updates: DFO report in October will clarify the tsunamis in Douglas Channel. Natural Resources Canada sent this statement to Northwest Coast Energy News on September 20, 2012. In reference to the opening paragraph of your September 18th editorial entitled Geological Survey of Canada identifies tsunami hazard: Possible fault line on Douglas Channel, we would like to clarify the following. Although the ancient large submarine slope failures which our scientists have identified may have caused tsunamis, this is not a certainty. It is important to note that Fisheries and Oceans Canada is currently studying this information to model potential wave heights and speeds. As our report states, only through the development and application of this type of tsunami modelling will it be possible to gauge the level of hazard posed by the identified submarine slope failures to shore installations and infrastructure, or to devise ways to effectively mitigate the impacts of future such events. Enbridge Northern Gateway filed this response to the Attorney General’s motion on August 31. 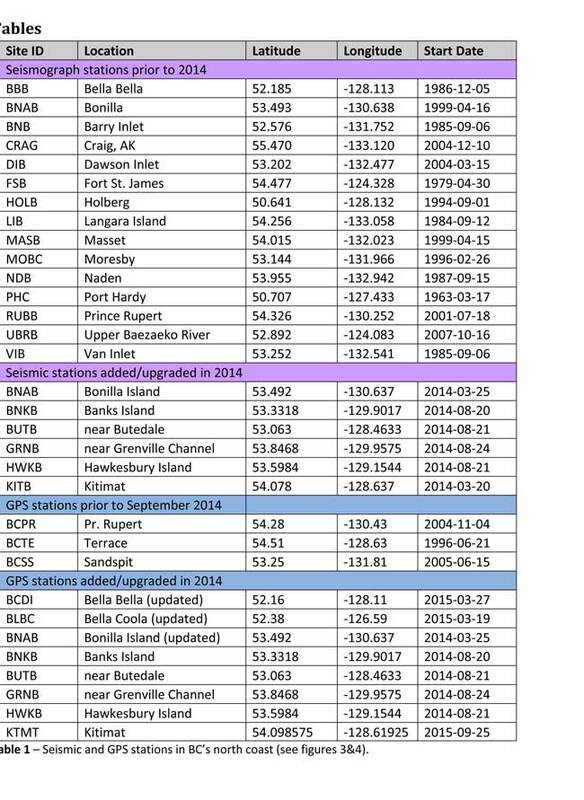 Tsunami Hazard in Coastal British Columbia: Douglas Channel and Kitimat Arm” regarding tsunami hazard and additional modelling work based on that report. Northern Gateway does not object to the filing of this late intervenor evidence. It may be relevant and Northern Gateway accepts that theevidence could not be filed earlier. However, Northern Gateway would like the opportunity to conductits own additional modelling work which it would be prepared to provide to DFO for comment prior to the filing of any modelling work by DFO in this proceeding. Attorney General response to Enbridge on September 10, 2012. Attorney General responds DFo is prepared to await filing its subseqent modelling work in these proceedings until such time as it has received, reviewed and commented upon additional modelling work as proposed by NGP Inc.
DFO is prepared to file its modeling work on or about October 31, 2012, but subject to any further direction or request by the panel.